On 1st April 2019, CITB increased funding for Apprenticeships in Scotland. The new rates will see a 4 year apprenticeship grant rise from £10,250 to up to £14,500. This boost is designed to encourage and help employers provide high quality apprenticeships. Following the success of National Apprenticeship week CITB announced a significant boost to funding for apprenticeships in Scotland. With the uncertainty of Brexit and apprenticeship reforms, construction apprenticeships have fallen. However, the training board predicts that 168,500 new jobs will need to be filled in the UK Construction sector in the next 5 years and believe apprenticeships are key in growing the domestic workforce. This April, CITB Attendance Grants increased to £2,500 per year and the CITB Achievement Grant rose to £3,500 for employers whose apprentice successfully completes their training. This means construction employers can receive up to £14,500 for each apprentice they take on. That’s an increase of 30%! The aim of this is to help employers develop and deliver high quality apprenticeships which are beneficial to both the apprentice and employer. Click here to find out more. 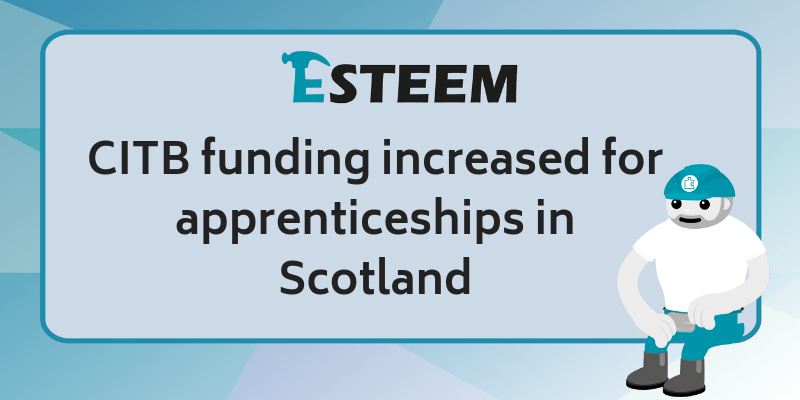 At Esteem we recognise the importance of investing in the workforce and we are thrilled to read about the increase in funding. We would love to know what you think about apprenticeships and the significant boost in funding.